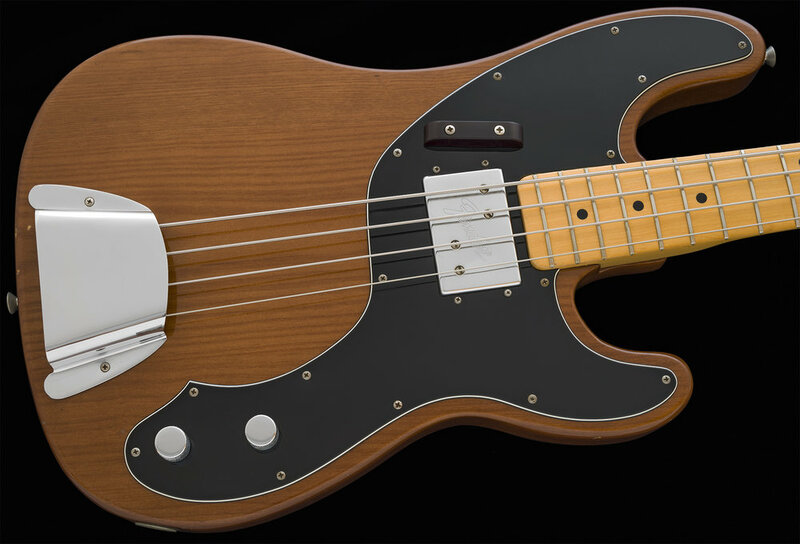 Fender introduced a Humbucking Pickup Telecaster Bass in 1972. 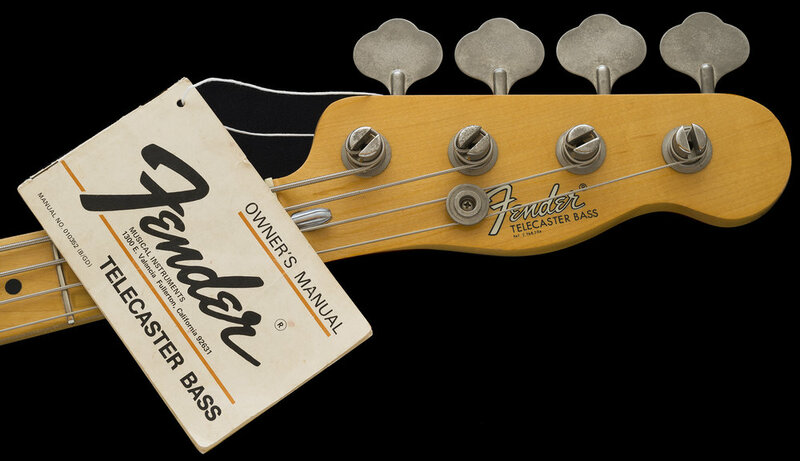 By this time, Fender had noticed that Rock players were adding Gibson Humbucking pickups to their Fender basses and surmised there might be a demand for it, this also occurred with the Telecaster guitar line too. Fender chose to install a Seth Lover designed, "wide range" humbucking pickup. These original double-coil models differed from most of the popular humbucking designs as these utilize adjustable Pole magnets vs. Bar magnets, which seems to give them more clarity and a wider frequency range, on a bass, these can really produce strong lows. These 2nd generation Telecaster Bass models also have Fenders newly-introduced Head-adjust Bullet truss rod, 3 bolt neck plates with micro-tilt adjustment systems and were available with Maple necks in 8 optional colors. 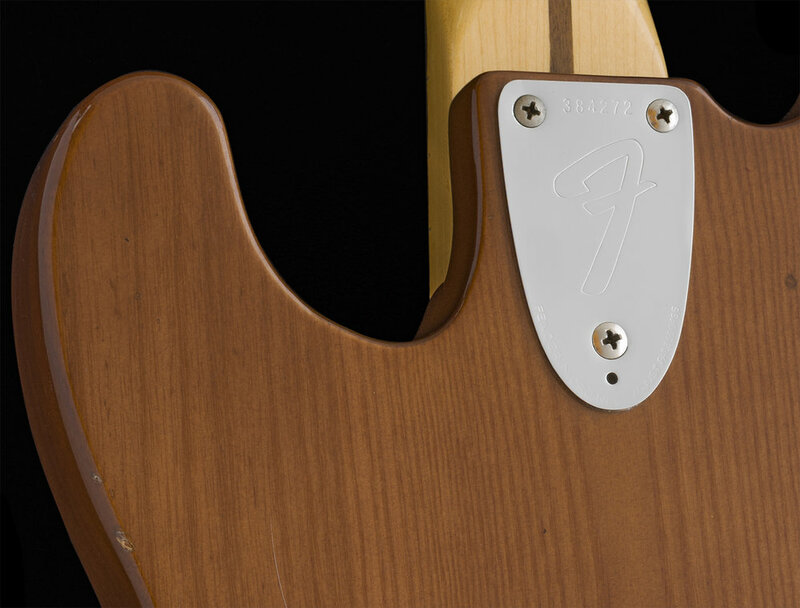 The Walnut finish option had not previously been available and I surmise that Fender had started to take notice of the many stripped-down, Brown-stained Fenders that were showing up in players hands, (a sign of the times) and were also floating about the used markets. I assume they determined there might be a demand for Natural and Walnut "wood" finishes versus the solid painted colors they were known for. They had already begun experimenting with Natural wood finishes prior to this time during the mid to late 60's. I have examined, tested, serviced and set-up this instrument and found it to be factory-correct and unmolested. All of the electronics, frets, nut, tuners, finish and both the plastic and metal hardware are correct and Original to the Bass with the exception of the "Thumb Rest" which I replaced with a newer one as it was missing when I purchased it. The potentiometers and pickup are dated the 9th week of 1974. The bass is in very nice condition. Globally there are some small marks, dings and signs of light playing wear, but nothing major to report that the photo's don't reveal. The bass is in very fine playing and working condition and the bridge is fully adjustable as all adjustment screws are lubed and working. The Original Hang Tag / Instruction Manual is still present. The CASE is Original to the Bass and is in excellent condition. The Handle has been replaced and the latches and hinges are all present and working well. The strings were just replaced with a NEW set of D'addario XL Round Wounds. I normally do not like New round wound bass strings because of the excess finger noise they produce until broken in, however, on this bass, they don't have the same effect. Perhaps the deep tonality of the Wide Range pickup is helping. The bass is now 44 years old. I acquired this one after I closed my shop and have had it for about 15 years. At that time, I also had 2 other examples that were both in mint condition and a bit too nice to use or risk damaging, so this one was purchased and satisfied my desire to occasionally play this model bass. These produce a very big sound, and because they are long scale, assisted by the Pole-Magnet pickup design, the sounds they make have clarity, a wide tonal range and definition when compared to short scale Humbucking basses, although both have their virtues. This model is quite unique compared to most Fender basses and would make a fun and affordable Vintage bass addition to a collection. I used it as an occasional player in my studio and had a lot of fun with it. Weight: 10 lbs. 9 oz.